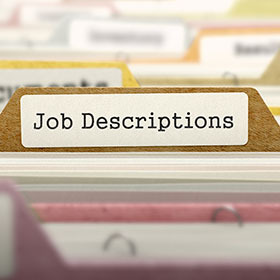 Job descriptions are written statements that describe the duties, responsibilities, required qualifications, and reporting relationships of a particular job. If drafted correctly, they can be an employer’s best friend. However, job descriptions that are out-of-date or incomplete can result in adverse determinations. Reyes v. Phoenix Beverages – Eddy Reyes was a sales representative for a beverage distribution company. Following an accident, he applied for and was granted FMLA lease. In anticipation of Reyes returning to work, the company sent his job description to his doctors, asking if there were any restrictions upon his return to work. Reyes’ job description detailed his sales responsibilities, including customer service skills, but made no mention of any physical skills such as walking, standing, pushing, or pulling. Reyes provided medical documentation that he could return to work full time, but should refrain from prolonged walking, standing, running or jumping. The employer advised Reyes that his previous position was no longer available, but it would find him a new position in 3 to 4 weeks. Reyes filed a lawsuit against his employer, Phoenix Beverages, alleging it violated the Family and Medical Leave Act. Under the FMLA regulations, an employer can only condition an employee’s return to work on a fitness for duty for a specific job if the employer provided a list of the essential functions of the job with the FMLA designation notice (i.e. within 5 days of having enough information to determine whether the leave is being taken for a FMLA-qualifying reason). Reyes employer waited until Reyes had been out on leave for several weeks before providing the essential functions of the job. The court stated that if Phoenix Beverages wanted to require that Reyes obtain certification of fitness to return to a specific job, it should have provided a list of essential job duties timely. Further, the job description that was provided to Reyes’ doctors did not include any physical duties. Had the job description stated that prolonged walking and standing were required skills or abilities for the position, the court may have ruled differently. Green v. BakeMark USA, LLC – Brian Green was an operations manager responsible for directing and coordinating all warehouse activities. Green claims his employer violated the Americans with Disabilities Act (ADA) when it failed to accommodate his disability by allowing him to work only four hours per day. The court ruled in the employers favor because testimony from management and the job description, which emphasized the position’s full time nature, made it clear that the job required a minimum of 50 hours per week. The purpose of a job description is to ensure that you are hiring the right person to fill the right position. Well-written and well-developed job descriptions are communication tools that allow current and potential employees to clearly understand the expectations of the role, its essential duties, the competences and responsibilities, along with the required educational credentials and experience. Further, as the above cases show, up-to-date and accurate job descriptions can save you time and money in litigation over what the essential job duties of a position are. To assist Nevada employers in this task, the Nevada Association of Employers (NAE) provides sample job descriptions for our members to use and modify, as needed, on our website.